We offer a variety of Tax and Accounting Services! 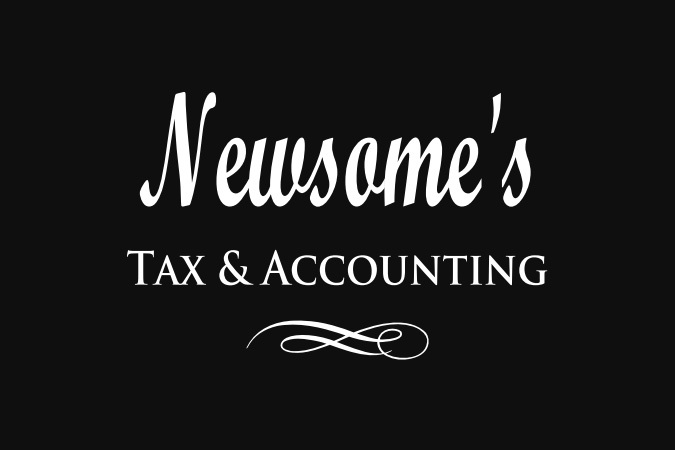 Click on the service to the left or scroll down for additional information on services that we, at Newsome''s Tax & Accounting, can provide for you! We are the premier virtual accounting office you need! We work for you, even as a member of your company, to assist and save you money. By hiring us, you would also save on annual salary, health insurance, employee taxes, workman�s compensation, vacation and sick pay (just to name a few) vs. one weekly, monthly or quarterly payment to a company that never goes on vacation or calls in sick. Monthly Profit & Loss Statements - Also called an Operating Statement allowing you to actually where you make your money and where you spend it. Balance Sheet � It summarizes your total business assets, liabilities and net worth crucial in make financial decisions about capital expenditures or how to improve profits. Bank & Credit Card Reconciliation � Needed in order to carefully track all income & expenses each month to ensure you are working with the correct total. General Ledger Report � Needed for audit or review, it is a record of the dates, check numbers, payees and amounts of all expenses within each of your business accounts. These reports will provide you with the assurance that your books have been properly prepared. With our payroll service, you make one payment per pay period and we handle the rest from employee withholding, employer match, & all monthly/quarterly reports. This also includes end of the year W-2's. How much easier could it get? Do you pay workers compensation or provide employees with insurance? We can track & handle that for you also. Call for an appointment today! We can handle your invoicing from creating client invoicing, tracking & paying sales tax, monthly client statements, to maintaining client receivables & collections. Let us help you! Are you tired of trying to budget your monthly bills? Well we can handle that for you and make sure all of your bills are paid on time, every time, because we know how important your credit is. With our budgeting skills, you will know ahead of time how much you owe so you can properly prepare. Give us a try, you won't regret it! Are you trying to start a new business yet, not sure where to start? Make an appointment, come talk with us & let us help you get started. We can help you make the right decisions like what type of business entity is right for you. We will also guide you in the right direction in making other decisions like do I need payroll, do I have to charge sales tax, do I need workers comp, will I be required to pay estimated taxes, or do I even need a business license? It is very important when starting a business to make the right choices because, as we all know, the 1st year is usually the hardest year. Why pay money you don't have to? Make an appointment with us today; we truly are committed to saving you money and growing your business. Why incorporate? Protection of personal assets would be the 1st answer. One of the most important legal benefits is the safeguarding of personal assets against the claims of creditors and lawsuits. Sole proprietors and general partners in a partnership are personally and jointly responsible for all the liabilities of a business such as loans, accounts payable, and legal judgments. In a corporation, however, stockholders, directors and officers typically are not liable for the company's debts and obligations. They are limited in liability to the amount they have invested in the corporation. For example, if a shareholder purchased $100 in stock, no more than $100 can be lost. Corporations and limited liability companies (LLCs) may hold assets such as real estate, cars or boats. If a shareholder of a corporation is personally involved in a lawsuit or bankruptcy, these assets may be protected. A creditor of a shareholder of a corporation or LLC cannot seize the assets of the company. However, the creditor can seize ownership shares in the corporation, as they are considered a personal asset. What type of business organization do you need and what are the tax benefits? Sole Proprietor � This means you report the income and expenses on Schedule C of Form 1040 and you pay the taxes in your tax bracket along with paying self-employment tax on the net profit. Partnership � Similar to a sole proprietor yet, the company files its own return 1st & all profits/losses are split according to your ownership percentage in the business & filed on your personal return. This also includes paying self-employment tax on the net profit. C Corporation � You are a protected entity yet, you pay 15% tax and have more expenses you can deduct then other entities There is the issue of double taxation if you receive dividends instead of payroll. S Corporation � Same as a Sole Proprietor yet, you have you personal liability protection. Limited liability Company (LLC) - Another business type that gives you personal liability protection. An LLC is similar to an S corporation with business income and expenses reported on your personal tax return. This means you report the LLC�s income and expenses on Schedule C of Form 1040?the same schedule used by sole proprietors. We provide notary services anytime you need it for $20. Call Patricia Jennings at (706) 464-0726 and make your appointment with her.